The caption on this picture from the Library of Congress reads "Jewish beggar at the Wailing Wall reading." 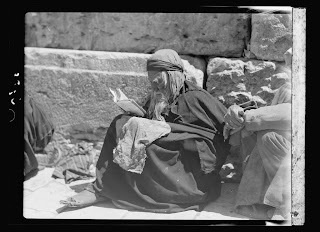 He may have been a beggar, but if you show the picture to Jerusalemites, they'll instinctively respond, "It's Tisha B'Av, and he's reading the book of Lamentations (Eicha)." Tisha B'Av is the day in the Hebrew calendar when calamities befell the Jewish people, including the destruction of both Temples in Jerusalem, the fall of the fortress Beitar in the Jewish rebellion against Rome, and the expulsion of Jews from Spain in 1492. The day is commemorated with fasting, prayers and the reading of Lamentations. In Jerusalem, thousands pray at the Kotel, the Western Wall.